Split holidays take you to Dalmatia on Croatia's south west Adriatic coast. It is a fascinating city with a long history and is a world heritage site. Holidays to Split can be taken at any time of year as the summers are long and hot and the winters are mild. It is an ideal location for a city break. 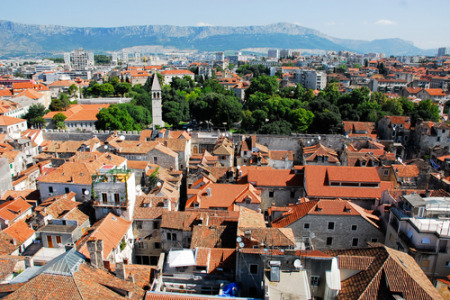 Holidays in Split are popular with couples of all ages and those wishing to combine a little culture with relaxation in an area of great scenic beauty. We have a surprising number of cheap Split holidays waiting to transport you to this idyllic spot. They are considered great value as our commitment to quality and service is never compromised by price. There is a small sand and shingle beach which is washed by crystal clear Adriatic waters, and numerous small rocky inlets. Excursions leave the port for offshore islands where there are sandy beaches for those who wish to bask in the sun. The architecture in the town dates from Roman times and progresses through the centuries. The Roman Diocletian Palace remains in use today. You can sit and enjoy a coffee among the pillars while contemplating life as it was lived two thousand years ago. If you are seeking a break with a guarantee of summer sun in an interesting city with good shopping, superb restaurants and a lively nightlife, you may be tempted by one of our low cost Split holidays. For further details and to view our best Split holiday deals, please use the search facility.